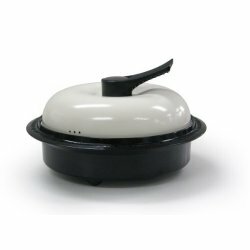 Microhearth Microwave Cookware is a piece of cookware that claims it can cook all your favourite foods without losing flavour you get from traditional methods of cooking. It claims you can steam, saut�, stir fry, boil, broil, bake and fry food using their cookware. The Microhearth is constructed of high-heat-resistant SPS plastic with low heat conductivity, the unit remains cool and retains its shape even during cooking and after multiple uses. The pan works by preventing electromagnetic waves from penetrating food, which causes food to dry out, and instead converts the electromagnetic waves into far infrared energy for cooking. The pans comes in variety of sizes and shapes to suit all your needs. With your help we can reach more people and let them know about Microhearth whether this product works or not. The Microhearth performs exactly as promised, which is rare this day and age. The meats brown, and stay juicy, not dried out. The vegetables steam beautifully. I made poached eggs and they were the best we have ever eaten. I would highly recommend the Microhearth to anyone who needs to cook, especially for one. The only variation is the strength of the individual microwave unit used. Once time adjustments are made-and they are easy-the product cooks like a dream.